With Sporting Gijón edging ever closer to the relegation trap door inthe top tier of Spanish football and Real Oviedo looking for a promotion play-off berth in the Segunda División B, next season could see the historic derbi asturiano make a very welcome return. Due to the two-division gap that currently lies between los Rojiblancos and los Carbayones, there hasn’t been a first-team derby game in Asturias since 2007 so, while Oviedo plays Sporting de Gijón B, the prospect of a renewed rivalry between the two first teams must whet the appetite of fans from both sides (although probably a little less for followers of Sporting who would probably prefer to stay in the top flight by choice). Overall, the 86-year-old derbi asturiano has been closely contested throughout its history and the two teams have met 117 times in all competitions. Despite their current Primera División status however, you may be surprised to learn that Sporting are playing catchup when it comes to head-to-head results – Real Oviedo have triumphed 49 times, while Gijón have won 38 games. There have also been 30 draws in the fixture over the years. Sporting won the first ever derby between the two sides 2-1 on 6 December 1926 in the Regional Championship of Asturias. The first La Liga derby took place during the 1944/45 season when honours were split over the season’s two games. Oviedo won their home fixture 2-1 but, at el Molinón, Sporting recorded their largest victory to date in the derbi asturiano: a 6-0 thrashing of their hapless rivals. The inaugural season of la Segunda División in 1928/29 also saw the inaugural Asturian derby in that division. At home, Oviedo thumped Sporting 6-2, while Gijón extracted their revenge in the return fixture with a 3-2 victory. As previously mentioned, the most recent La Liga derby between los Rojiblancos and los Carbayones took place in 1997. Oviedo were, once more, successful this time, securing a 2-1 victory and Gijón went on to be relegated. The misery was compounded as Real Oviedo stayed in the top flight, however that was only until the 2000/01 season. Oviedo subsequently went on a downward spiral and plummeted to the fourth tier of the Spanish game after they were punished for an inability to pay their player’s wages. The club have begun their revival however, and were promoted to the Segunda División B in 2009, where they are now in their third season. It might not be a derby of Barcelona – Real Madrid proportions, but this historic rivalry means just as much to the people of Asturias as el clásico does to the inhabitants of Madrid and Catalunya, and you can bet the thought of a possible resumption of the rivalry will not be too far from the minds of players and fans of both teams as they glance at the current league tables. 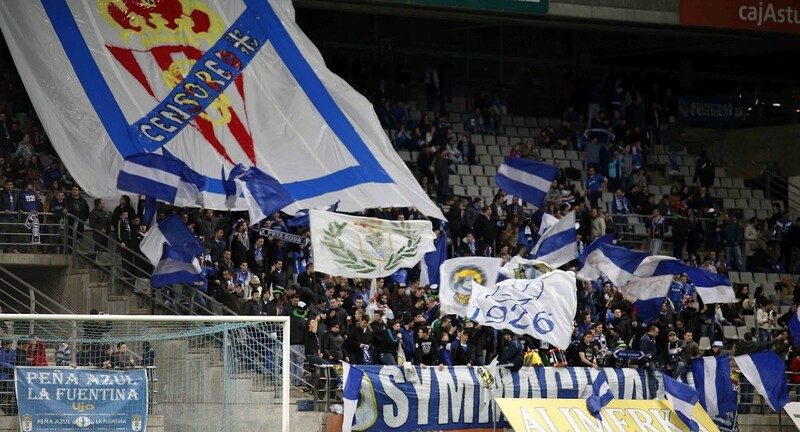 Real Oviedo!! We’ll be back! !